Last Thursday I participated in Instagon 543 at the Luggage Store Gallery in San Francisco. Instagon is an improvising ensemble where the personnel change every time, i.e., no two performances contain the same group of people. In addition to myself and Lob, the group’s founder, this version included Lena Strayhorn, Mark Wilson (aka “Conure”), Alan Herrick, Martin of Vernian Process, and Blancahillary (aka Hillary Fielding). 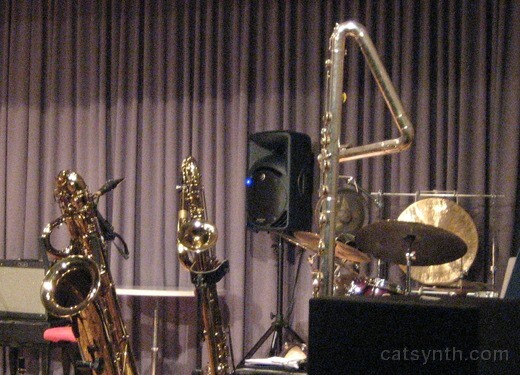 I had brought instruments from opposite ends of the size spectrum: the Nord Stage and the iPhone 4, on which I played the Smule Ocarina and Leaf Trombone apps, as well as Bebot and Nlog which I have used in previous performances. Lena Strayhorn had acoustic instruments (to be played into a microphone) including a flute and a large one-of-a-kind kalimba-like instrument. 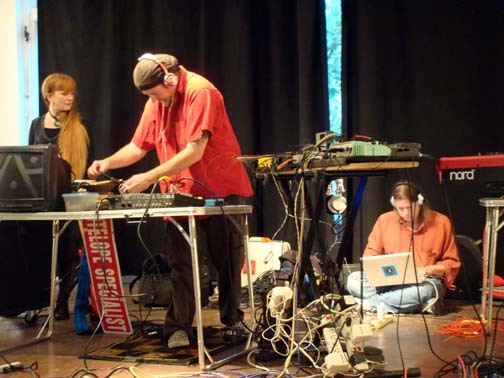 Mark Wilson had a large array of electronic sound sources and effects, Alan Herrick performed via laptop, Martin and Blancahillary played guiltar; and Lob played bass and the main mixing board. Basically, everyone was improvising independently, with Lob controlling levels via the mixing board. As he brought performers in and out of the mix, everyone was (presumably) listening and adapting their performances, which turn may or may not be presented in the mix. 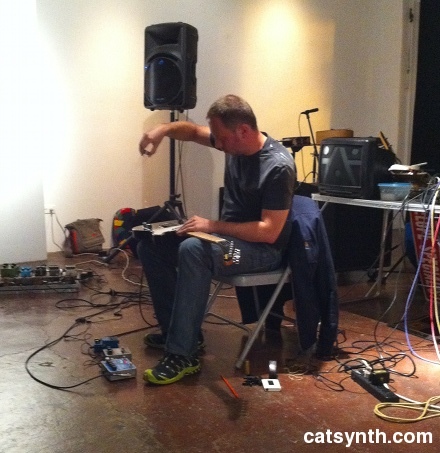 Thus there was a complex feedback loop with the live mixing and the instrumental improvisations. Musically, the overall the theme was “drones and creepy.” As such there were lots of long, drawn-out tones from everyone, with periods of noise and static, heavy distortion or large tone masses. I used the electric piano on the Nord to contribute to the “creepy” theme, with augmented chords and effects that resembled a 1970s horror-film soundtrack. 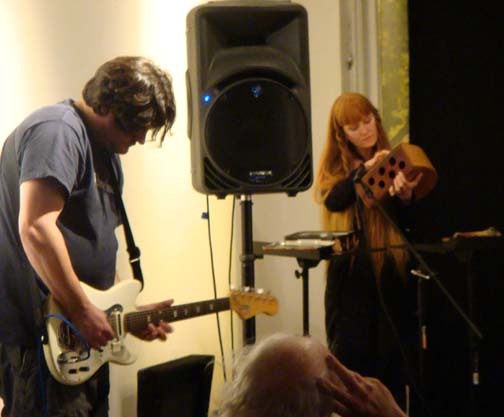 It was in fact hard to sometimes hear who was performing what, although Lena Strayhorn’s acoustic instruments were quite distinctive, and Blancahillary’s guitar playing was more staccato. I found that the Ocarina iPhone app was picking up and responding to the ambient sound from the speakers, so I spent a fair amount of time with it, bring the iPhone closer to the speaker to manipulate the sound. Its output was of course then fed back into the overall mix. An additional level of “chaos” was Blancahillary’s “performance” with aluminum foil. She unrolled a large sheet, first using it as an acoustic sound source by shaking and crumpling it. She then tore off pieces which were lobbed at audience members and at other musicians, and finally she fashioned a large piece into a mask (covering her nose and mouth) that matched her silver pants. As one might expect from a complex non-linear feedback system, there was quite a bit of chaos, relatively controlled chaos. There were many moments there in fact quite loud, and the overall texture was quite dense. But there was still a lot of variation and an overall structure to the set. 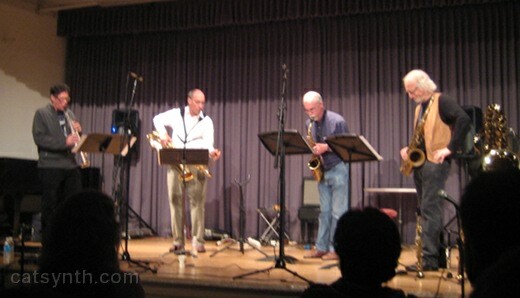 At the very end, Lob introduced each of the musicians and provided an opportunity for everyone to play a momentary solo so that the audience could hear his or her contribution to the overall performance. 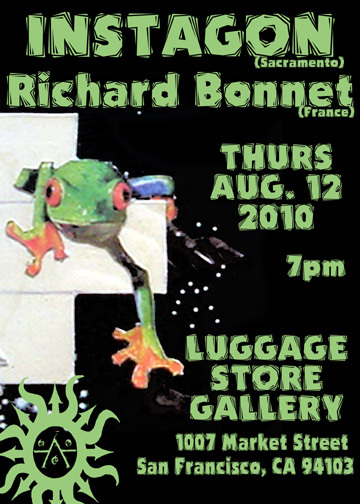 We were preceded on the program by a solo performance by aris-based guitarist Richard Bonnet. 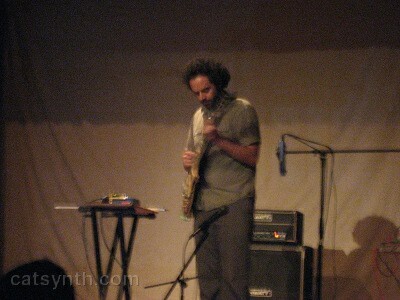 The first pieces in his set were based on more conventional musical techniques, but very well done. He opened with a series of percussive and harmonic tones that moved between more dissonant (seconds, tritones) and consonant harmonies. He used some delays that produced rhythmic patterns that gradually disintegrated. 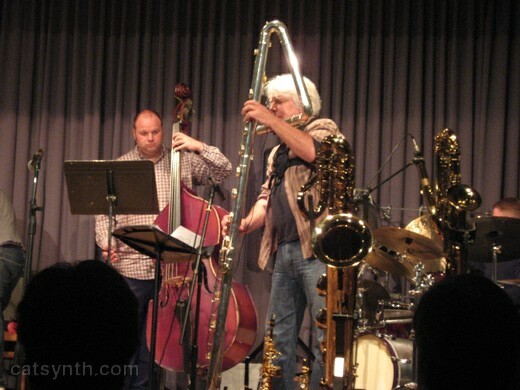 From these pieces, he built up a big cloud of sound that narrowed to a lone almost pure high tone. The second piece was more virtuosic in terms of finger work. It felt “bluesy” in terms of slide technique and vibrato, but the harmonies were very different from any standard blues. The third piece was more of a minor ballad with lots of melodic material and implied harmonies. It resolved into something that sounded more latin but then suddenly became more abstract with back-and-forth between fingerwork and chords. 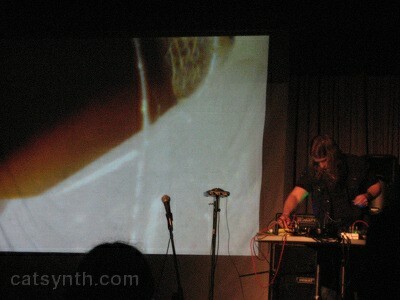 In the remainder of the set, Bonnet brought in more experimental techniques. The next piece was darker, with lots of low tones and real-time manipulation of the tuning pegs, and use of an e-Bow for long drones. The overall tone with more “electric” between the use of the e-Bow and distortion. The melodic lines were more abstract and interspersed with sustained lines, timbral effects and harmonies. 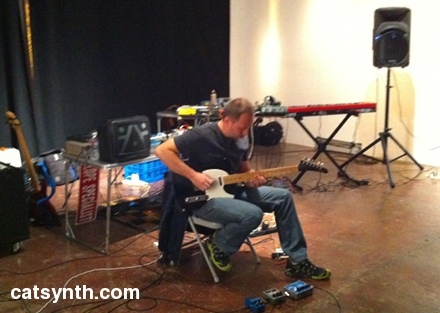 Some of the sounds seemed more synthesizer-like, but his conventional guitar technique continued at the same time. The piece ended with darker and grainier sounds, a long high note coming out of a dark cloud, and then fading out. The final piece explored “prepared guitar”, in which various objects are placed in and around the strings to alter the sound and behavior of the instruments. Some of the objects included a bottle, a metal slinky that produced very scratchy sounds, and a chopstick under the strings. This was combined with delays and other electronic effects. The overall sound was eerie and haunting with sliding notes, like an old suspense film, with percussive and scratching sounds that not surprisingly reminded me of a prepared piano. From the delay lines and loop emerged that became a background jazz riff, but some buzzing and other complex sounds. This was probably the most fun piece of the set, and a good conclusion. No sooner had concluded my recent performance with Reconnaissance Fly at Luna’s Cafe in Sacramento than I find myself with two more shows before next Monday. INSTAGON is a term coined to describe the SPONTANEOUS FACTOR, the essence of Chaos Theory… everything that happens in this universe changes instantaneously upon its creation… nothing stays the same… everything changes, and is gone in an instant… hence INSTAGON.